Completing a degree or qualification is a hard task. But it is even more tricky to study effectively with a full-time job. On top of commuting and working 35+ hours a week you also need to find the time, energy and motivation to tick off your studying to-do list. There are a ton of benefits to studying alongside your full time-job. - Demonstrate to employers your commitment, drive and perseverance. - It takes longer to complete your qualification (if you study part-time). 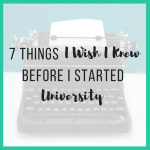 In this blog I’m going to share seven tips to combat these drawbacks and help you study effectively with a full-time job so you can achieve the grades you’ve always wanted – without losing your sanity. 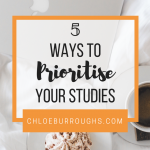 If you want access to a whole heap of printables, planners and worksheets to help you achieve studying success, sign up to my free resource library below. When your weeks are crazy-busy it’s easy to tell yourself you’ll study at some point…but then life gets in the way. Falling behind when you work full-time is terrifying because it’s so much harder to catch up when you're already short on time. To keep yourself on track, commit to planning your week in advance. Spend ten minutes every weekend looking at your commitments for the week ahead as well as your course syllabus or outline. Determine how much studying you have to do and book your study sessions into your calendar. Scheduling your study time will improve the likelihood of you completing your to-do list. If you do this every week you’ll see improvements in your stress levels and grades. Sign up to the resource library above to grab my monthly, weekly and daily planners to help you put this step into action. If you want to study effectively with a full-time job then you need to exploit what you can. We each have unique energy levels and there are times in the day when we have the most energy or are the most productive. Maybe you’re an early bird and feel like you do your best work first thing. Or maybe, like me, you’re a night owl and get into your groove in the evening. Identify your most productive time and exploit it. 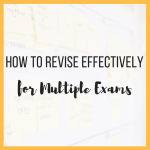 Find ways to flex your schedule to enable you to study during this time. Do you need to wake up earlier? Could you arrive at work earlier to study? Can you clear your evenings a bit to allow for more study time? A strong circle of supportive friends and family is invaluable to a working student. They can motivate you when you can’t be bothered, pick you back up after a low grade or give you a pep talk when you’re doubting yourself. They can be your biggest cheerleader when you do well and your kick in the pants if necessary when you’re slacking off. Don’t be afraid to reach out and ask for help. 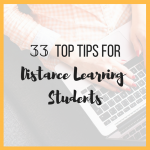 And if your circle is a little lacklustre in the support department then expand it and find some other students who are working full-time that you can share this journey with. Sit down with your manager or HR support and ask them if there are any opportunities for flexible working. Being able to flex your working hours or be able to work from home occasionally could save you a lot of commuting time and help reduce your stress. Alternatively, if your course is relevant to your role and could help the company then ask them if they would be willing to discuss study leave. I sat down with my manager and asked for study leave by outlining the ways I could apply my degree learning to help with specific company problems. My pitch was successful and they granted me two days a month study leave – scoreee! Even if you don’t think this is possible where you work, I want to ask you, what’s the worst thing that can happen? They could say no but they could say yes. Make sure you structure the discussion by outlining the benefits to the company of an arrangement like this. Traditional students who don’t work can afford to be inefficient with their study time. 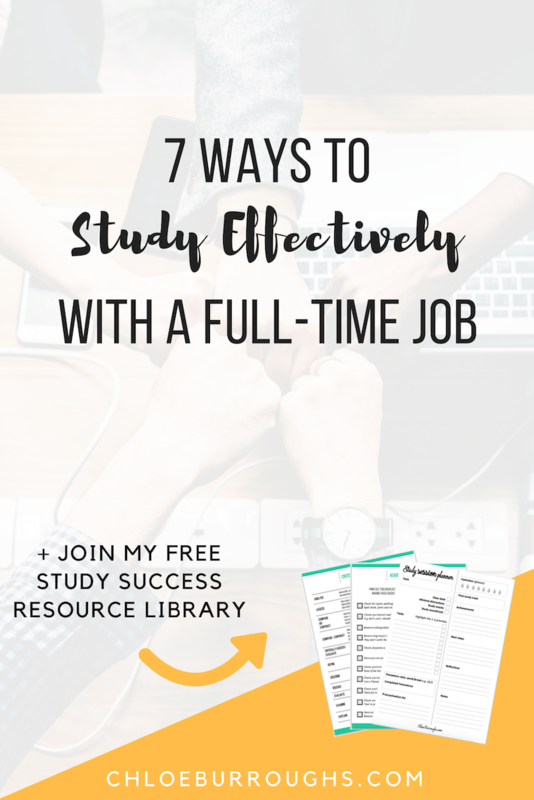 If you want to study effectively with a full-time job than you need to make the most of your limited time. This means making sure every study session is productive and that you focus on your priority tasks first. 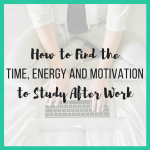 For more advice on intentional, productive studying read my blog posts on the first steps of a great study session, the last steps and the incredible Pomodoro Technique. Successful studying consists of delaying instant gratification for long-term gain. 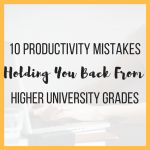 Ultimately, you must refrain from daily Netflix-binges and study instead so you can graduate with grades you are proud of. To help you ditch the procrastination, plan rewards to motivate you to study when you’d rather be having fun. Look in your calendar for the due dates of your important essays and exams and plan a treat to celebrate your hard work. This reward could be a new novel, some shoes, dinner out, a coffee date or a day trip – anything that will help you stay focused on your long-term prize. A full-time undergraduate degree will typically take three years to achieve (120 credits a year). A working student is likely to study part-time so a degree may take four to six years or more to obtain. This will feel like a LONG flipping time so it’s easy to feel disheartened and to start questioning your decision to work alongside. So I want you to remind yourself of the value of working full-time while studying. As well as continuing to earn a salary you are also racking up years of workplace experience. When you change jobs or ask for a promotion in future you potentially will be in a better position than traditional students who do not have much, if any, work experience. I hope these tips help you study effectively with a full-time job. 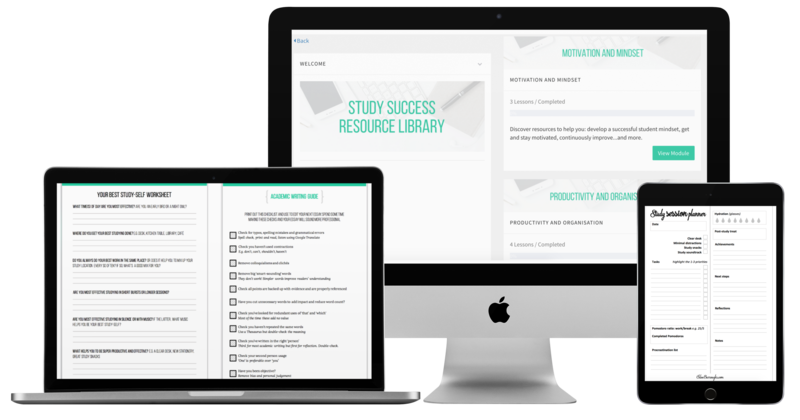 Don’t forget to sign up to my free resource library if you want more help with your studies.